My morning routine starts before I wake up the kids. I keep it simple since, well I am not a morning person. I enjoy that half hour or 45 minutes of peace and quiet before the kids wake up but I literally have to roll myself out of bed to get started. I try my hardest to get all of my morning routine chores out of the way before I have my first cup of coffee for the day. By that time the kids are up and I need the extra kick. On weekdays I get up at about 6 am never any later, then I just feel way to rushed. My morning routine has changed since Bri and CJ have started school. I do the same tasks but everything has moved up during the day. On the weekends we try to sleep a little later – when they let me but I still stick to the same morning routine. I like to start my day off with the same morning routine so it sets me up for success throughout the day. I started routines after the first year I became a stay at home mom. I just needed the structure and it made me feel more accomplished. I floundered that first year and honestly, I couldn’t stand it so something had to be done. Make My Bed – This is the very first thing I do as soon as I get up. 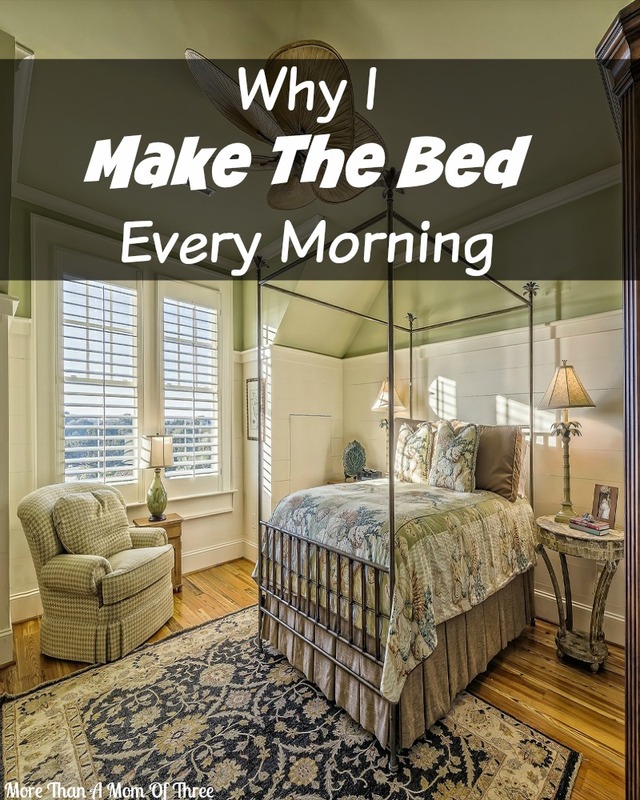 I talked about why I make my bed in a post I wrote last week. By making my bed not only does it allow me not to crawl back into it but its a small task. It takes just a few minutes and instant gratification. Start A Load Of Laundry – The night before I try to have a basket of laundry ready to go right into the washing machine. I found if I don’t start something right away, I never will during the day. Once I get back from dropping off the kids at school, I switch it right over to the dryer. This keeps me on top of my laundry. I do one load a day, with 3 kids its worked out really well that way. Unload The Dishwasher – I head into the kitchen and start unloading the dishwasher while I finish packing the kids lunchboxes. (Tip- I do this the night before and just throw in their ice packs in the morning, this is part of my nighttime routine). Wipe Down Bathrooms – This became important when I had boys fully potty trained. Moms of boys you know what I’m saying. As soon as JJ and I get back home I hit the bathrooms and wipe down the sinks and toilets. It makes deep cleaning SO much easier. A good morning routine starts off with a nightly routine for me. I’m working on that post next. They sort of go hand in hand. By setting up your morning the night before it makes for easy sailing mornings and I get off to the right foot for the day. Start off with writing it all down. 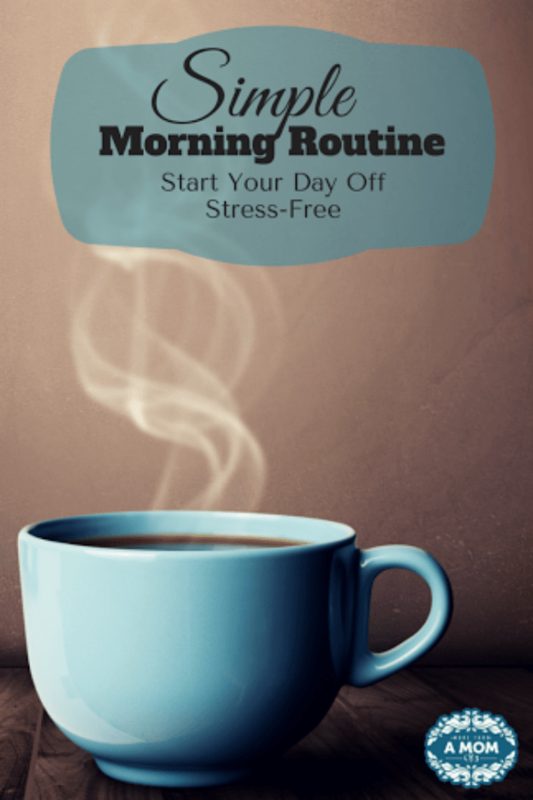 I designed a simple free morning routine printable for you to start off with. Keep your morning routine simple no more than 6 easy tasks that you can easily manage in less than an hour is my goal when I made mine. Not every morning routine will work for you. Don’t get discouraged if you have to tweak it a bit the first time or two. What does yours look like? I am always fascinated how other moms schedule their day. As a busy mom who is always on the go, it can be easy to feel overwhelmed and unorganized in the home. From toys to seasonal clothing items, it can be easy to feel like the home is filled with clutter that quickly accumulates. To keep your home organized and in control of the space, there are a few tips to follow for a tidy environment. Instead of feeling overwhelmed with junk mail and bills that you receive each day, use a mail sorter that allows you to come back to the paperwork and handle what’s most important based on the level of priority. You’ll have peace of mind knowing that you don’t have to leave a pile of unorganized mail on the dining table. Stay on top of your cleaning schedule by keeping a calendar on your refrigerator with the chore list clearly labeled throughout the week. It will allow you to conquer each day’s tasks without feeling overwhelmed. 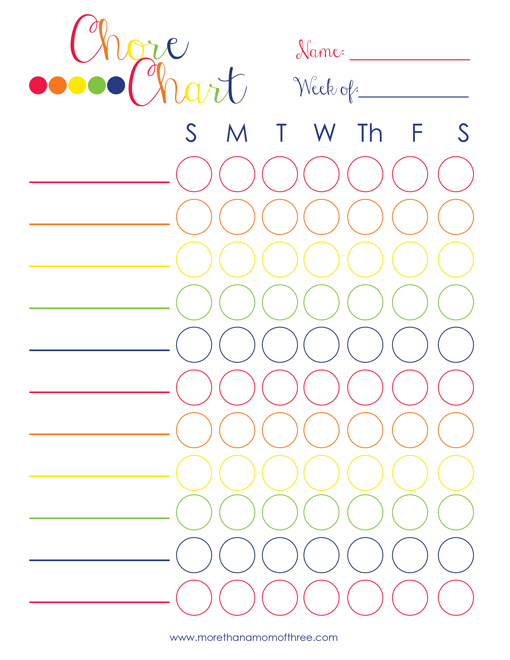 I like to keep the kids chore chart on my fridge too, you can download mine for free. If you’re a busy mom who has a handful of kids to care for, then you likely are used to seeing closets where the clothes are on the floor instead of neatly hung on the rack. You can remedy the problem by adding more hangers for a simple way of keeping everything organized, say the experts at National Hanger Company. You can buy then in build for you and the kids so you can keep everyone’s closets neat and organized. Instead of allowing your home to become overrun with clothing that you won’t use for another few months, make it a point to only keep seasonal clothing in the closets. All other heavy jackets, bathing suites, or snow gear can be vacuum sealed in bags and placed under a bed. Instead of simply tossing all of the kids’ toys in oversized trunks, allow them to stay organized with clear bins that have labels on the top. I love the labels from Mable’s Labels. This will also help to teach your child how to clean up properly and where each toy belongs. If younger children, colored bins may work well. Instead of accumulating a junkpile of paperwork, scan the important documents onto a computer and store them on a hard drive for a convenient way of going paperless and reducing your home office’s clutter. By learning how to manage the large amount of paperwork and products in your home, it can be easier to remain clutter-free and in control. You’ll not only reduce the junk in each room, but can have less stress with managing the space throughout the week. An organized home can create a calming environment, while a cluttered home often only causes stress. 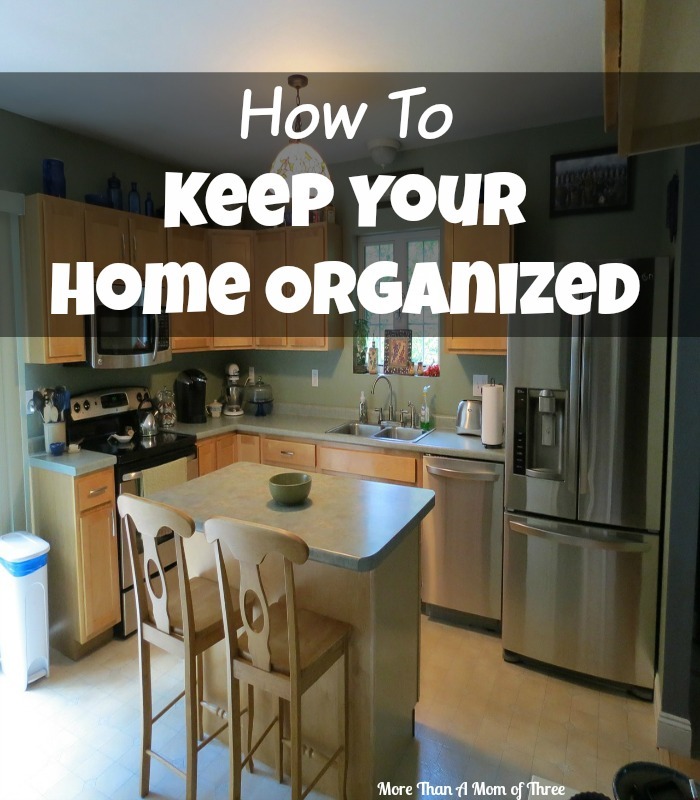 How do you keep your home organized? There is one thing that I do every morning without fail. Literally the house could be in shambles, I haven’t had my morning coffee or even brushed my teeth. I make the bed. When I had my daughter, Bri 8 years ago I scrambled trying to figure out how to be the best stay at home mom I could be. I went from having a job to staying home an I sort of felt lost. I strived for a purpose and balance in my day. There was so much that I felt I needed to get done on a daily basis and each day fell into the next. It began to take a toll on me and how I functioned as a mom and a wife. I read an article somewhere that said by making your bed can change your overall outlook on your day. Honestly, I thought that’s the stupidest thing I’ve ever heard. How can by just making the bed change how your day looks? I was reading to far into it. Little did I know, by tackling smaller tasks, it does make you feel more accomplished. I never looked at it like that. It’s takes what? 3 minutes to make the bed? It changes your mindset on how you look at the room for the whole day. As stupid as it may sound by just making my bed I felt like something got done that day. Even if I cleaned nothing else in our house at least the bed was made. Every time I walked into my well put together bedroom it gave me motivation to keep it that way all day long. Silly right? I know I thought the same thing, what a waste of time. But it works. By making my bed first thing in the morning sets off my whole day in the right direction. I feel an instant feeling of accomplishment and gratitude. It makes me want to stay positive all day and maintaining the chaos of the rest of the house. Making my bed is now part of my morning routine. Every day no matter what I get it done. If you are struggling with feeling like your home is in constant chaos try making your bed for 3 weeks, every day. No really, every day! Keeping a clean house is not easy! I don’t know about you but I need a main cleaning list that I go off of when I make my daily to do lists. This way nothing gets missed, it’s all there on my command center weekly cleaning list printable. Once I started keeping a weekly cleaning list, I realized every room can get easily broken up into its own day. By doing a room a day or different zones depending on what you call it you do not have that panic day of trying to clean your entire house. Before I had children I was able to spend an entire day cleaning and getting organized, it was usually a Sunday. My husband got to watch football while I cleaned, seems unfair now since we both worked tee – hee. Once I had my daughter and became a stay at home mom that was no longer possible for me. Forget it, after I had all three kids running around! Oh I couldn’t keep up and felt that my home was a war zone. The weekly cleaning list printable is not set in stone. If I miss something, it’s okay with me and I just make it up next week. I feel so much better about my house when I can have that unexpected guest stop by. Sure there are still toys everywhere but at least it’s clean. I feel more accomplished every day that I am not spending hours cleaning. A typical day of cleaning now is no more than an hour on average. 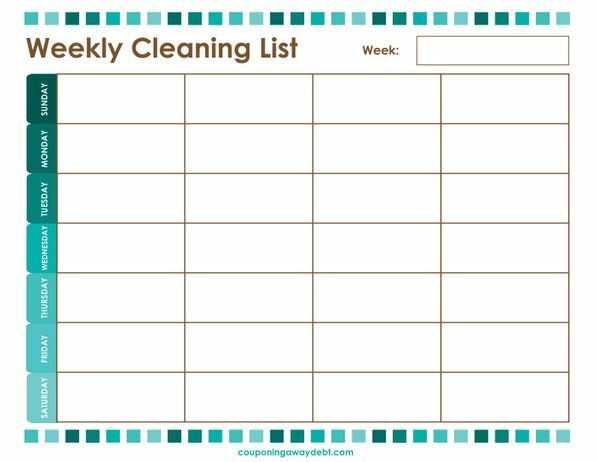 I have a free weekly cleaning list printable for you to download to add to your home binders. 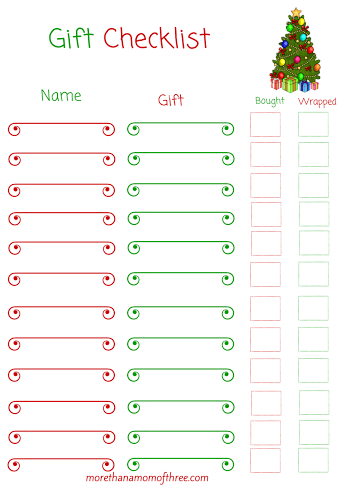 This one is editable like some of the other printables I have. It stays neat and clean typed out once you find what works best for you. I am always looking for a way to motivate my kids to help more around the house. Who isn’t? 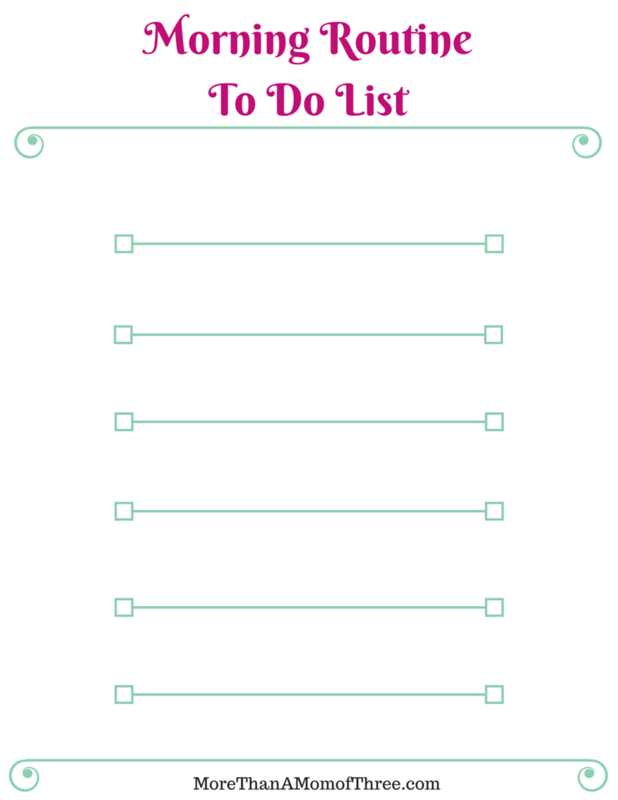 Since I am a list maker by heart I figured a chore chart is just what they needed. My older two who are almost 7 and 5 have become little list makers themselves. Ahh makes a momma proud ;). I think especially now that they can write on their own, they want to write anything I will let them write on. Let’s face it we mom’s and dad’s need help around our homes. Even if it is as simple as making their own bed, dumping the bathroom garbage or putting away their clothes after I fold them, it all helps a little.My three year old even has his own chores he makes his bed and feeds our cat Garfield. It makes his feel that he is helping and with 3 pairs of hands helping me every day it makes my day run smoother. Bright colors and easy to read makes it fun for them to get started helping.